Unfortunately the "Free Easter Bunny Plush" offer is no longer available. Your loved ones of all ages will love to see this adorable one of a kind collectable bunny in their Easter basket! This sweet bunny features adorable floppy ears, a soft blue sheer fabric ribbon tied in a bow, corduroy nose and embroidered eyes, and is ready to wish you a Happy Easter! This fluffy hopster bunny is crafted of a high quality, super soft plush material in beautiful soft grey color that you will love to cuddle up with and will make the perfect gift this Easter! The year is embroidered on the foot making this lovable bunny a treasured item you will want to collect each year. 3. 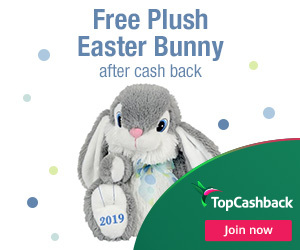 Add one (1) Way to Celebrate Easter Gray Hopster Bunny 2019 Plush priced for $7.99 to your cart and shop as you would normally then checkout. If the price changes or anything happens to the stock, the deal is officially over. 4. This is a free in-store pick up offer. 5. In about 14 days $7.99 cashback will post in your TopCashback account.